What is WSO2 Identity Server? WSO2 Identity Server is an open-source rights management and unified authentication server designed to simplify identity and access management (IAM). It is a unique solution that streamlines the sophisticated identity and security management of mission-critical APIs, web applications, and services in the cloud, on premises, or on mobile devices. The platform makes life easier for architects and developers with its stress-free, minimal maintenance and monitoring requirements. WSO2 Identity Server functions as an enterprise identity bus (EIB) or the backbone to manage and connect numerous identities in spite of the standards they are based on. The server offers unprecedented performance and governance to enable businesses in the retail, financial, manufacturing, logistics, travel, healthcare, and telecom sectors to streamline all IAM related activities. 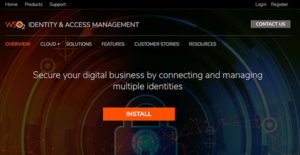 Some of its main features include identity federation, strong authentication, identity governance & administration, Single Sign-On, and access control. WSO2 Identity Server is an easy-to-use toolset that enables you to manage identities and unravel all identity-related problems. The platform supports centralized administration, management, detection, and monitoring of identity-centric activities while allowing you to establish and uphold proper IAM policies and procedures. It simplifies rapid provisioning without compromising security and unifies access and identity management to make it easy for IT admins and other employees to adhere to the stipulated policies and processes. The platform also provides custom tools and scripts that ensure rapid deployments and help you go to market quickly. Additionally, WSO2 Identity Server provides both its source code and the binaries under the business-friendly Apache 2.0 open source license. This gives your developers and architects the freedom to tailor the application to suit the way your business operates. It allows you to pick federation mechanisms, standard formats, and authentication formats to match your needs. Also, the program offers numerous policy & workflow templates, reference architectures, and samples that help you cut down redundant efforts and facilitate faster implementation of IAM solutions. In addition to its user-friendly management operations and ease of deployment, WSO2 Identity Server offers powerful capabilities featured in a component-oriented architecture. The solution allows you to deploy the capabilities in a topology of your liking based on your business requirements in scalable, adaptive, and secure manner. Its Single Sign-On module supports SAML2 and OpenID connects and permit SSO between cloud and on-premise applications. Better still, there are options for multifactor & multi-option authentication support, Fine-grained authorization with XACML policies, and API security with access controls that leverage multiple grant types. If you are considering WSO2 Identity Server it could also be a good idea to investigate other subcategories of Best Identity Management Software gathered in our database of B2B software reviews. It's essential to keep in mind that almost no app in the Identity Management Software category will be a perfect solution able to meet all the goals of various company types, sizes and industries. It may be a good idea to read a few WSO2 Identity Server reviews first as certain solutions might excel only in a really small group of applications or be designed with a very specific type of industry in mind. Others might function with an idea of being easy and intuitive and consequently lack complex elements welcomed by more experienced users. You can also come across software that cater to a wide group of users and offer a complex feature base, however that usually comes at a more expensive price of such a software. Ensure you're aware of your needs so that you buy a service that provides all the functionalities you search for. How Much Does WSO2 Identity Server Cost? We realize that when you make a decision to buy Identity Management Software it’s important not only to see how experts evaluate it in their reviews, but also to find out if the real people and companies that buy it are actually satisfied with the product. That’s why we’ve created our behavior-based Customer Satisfaction Algorithm™ that gathers customer reviews, comments and WSO2 Identity Server reviews across a wide range of social media sites. The data is then presented in an easy to digest form showing how many people had positive and negative experience with WSO2 Identity Server. With that information at hand you should be equipped to make an informed buying decision that you won’t regret. What are WSO2 Identity Server pricing details? What integrations are available for WSO2 Identity Server? If you need more information about WSO2 Identity Server or you simply have a question let us know what you need and we’ll forward your request directly to the vendor.